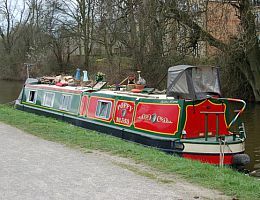 The 40x680AT and 50x680AT ring type anchors are the ideal replacement for old mooring spikes. They require much less effort to drive in, the thread grips the ground far better than a plain spike, and perhaps best of all, they are always easy to remove and do not damage the ground during removal. Trees, fences etc. often need support for safety. 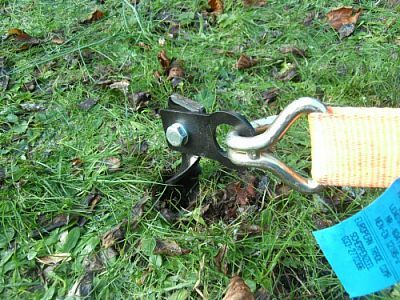 The Erdanker range of ground anchors can provide a simple to install anchor point for use with strops, ratchet straps and rope. As no rigid fittings are possible to prevent autorotation, the pull should be kept to less than 45 deg from the horizontal, which can require the anchor to be hammered in at an angle. 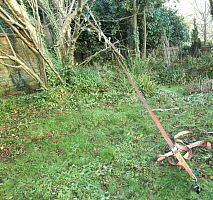 The anchors are widely used when trimming or removing trees, they ensure cut branches fall in the right direction. A quick, low cost method of securing trailers. 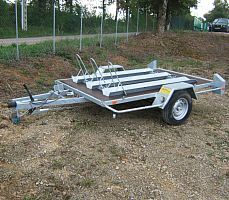 Unattended caravans and small trailers are an easy target for thieves as they are so readily moved. The larger Erdanker® chaining anchors offer a simple, fast and low cost method of assisting in securing them to the ground. 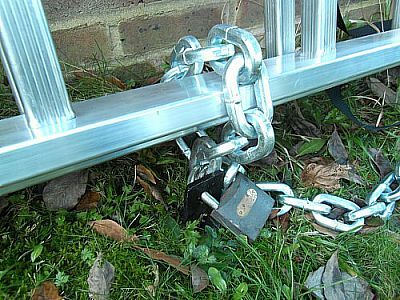 If the 16mm dia hole in the chaining anchors is not large enough for your padlock, or you want to put the chain through the anchor, then the AT ring type anchors are better, they have a steel ring through the top and can lie flush with the ground when not in use. Security advice from the Police is "...do not leave ladders outside if they can provide access to otherwise inaccessible parts of your house. 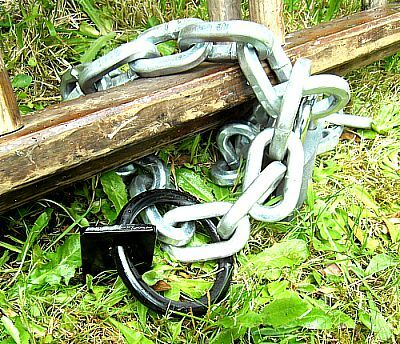 They should be chained and padlocked to a strong anchor or wall"
If you do not have a convenient wall then use an Erdanker® ground anchor. 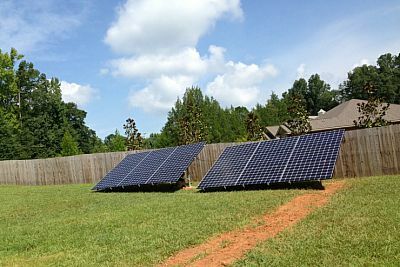 They take around 5 minutes to install and are very low cost. 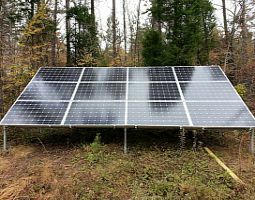 The 50mm anchors are used to secure small solar panels, they permit installation in any weather and do not need concrete. They can also be easily removed.